Russian airlines will require from 1,700 to 2,000 new passenger aircraft through 2035. More than a half of this number, from 1,100 to 1,300 units will be mainline airliners, Russia’s vice-minister for transport, Valeriy Okulov forecasted this week. The government hopes to meet with demand with locally made commercial aircraft. “The average annual acquisitions rate stands at 60-70 aircraft per year. With replacements factored in, the average number of deliveries reaches 75-85 aircraft per year. In the last decade airlines received in average of 82 aircraft per year,” Okulov said. He also added that about two thirds of deliveries are aircraft with the seating capacity of 50 to 110 and 140 to 220 passengers. Russia’s total mainline airliner fleet, which currently stands at 579 aircraft, is expected to expand by 140 units by 2020, according to the forecast made by State Research Institute for Civil Aviation. For the same period up to 300 aircraft currently in operation will have to be replaced. Russian carriers currently operate 494 Western-built aircraft with the average age of 11 years. Western-built aircraft comprise about one third of the fleet in the regional segment. According to Okulov, the majority of Western-built aircraft are leased for the period between seven and 12 years (in 80% of cases – between seven and 12 years, and 5% – more than 12 years). “It’s safe to forecast that by 2030-2031 all of the aircraft currently in operational leasing with Russian airlines will be phased out. They will be replaced either with next generation Russian-made aircraft or foreign-built aircraft,” Okulov emphasized. In the meantime the global airline industry is observing the trend of increasing the initial leasing term for new aircraft, which is linked to the fact that the new generation aircraft have extended intervals between key maintenance checks, the official explained. So aircraft require the costly heavy checks only after 10 to 12 years in operation. “We need to proceed with creating conditions for consistent step-by-step transfer to operating primarily Russian aircraft, which would meet international standards, within the time-frame of 10 to 15 years,” Russia’s vice-premier Dmitry Rogozin said. He encouraged Russian aircraft manufacturers, financial and leasing bodies to join efforts to elaborate a coordinated strategy and measures that would stimulate Russian airlines to acquire locally-built aircraft. The government promised that those carriers that will operate Russian-made aircraft will have preferences in receiving subsidies and commercial rights. Yuriy Slyusar, president of Russia’s United Aircraft Corporation reminded, that according to the corporation’s revised strategy, the share of commercial production in its portfolio should increase to 45% from the current 20%. This should be made possible due to increase in demand from the domestic market. According to UAC’s earlier research, in the period from 2016 to 2035 Russian carriers will require up to 1,130 new aircraft with the seating capacity of over 30 passengers. The most popular narrowbody 120-seat segment will need up to 710 aircraft. “Considering the current fleet condition on the domestic market, we estimate that the new surge of demand for widebody aircraft should occur in seven to 10 years,” Slyusar said. He also added that the regional segment is experiencing deferred demand because of ongoing operation of Soviet-built Antonov aircraft. They are expected to be phased out by mid-2020s. “Our objective is to replace them with new Russian-built aircraft. The demand in this segment is expected to reach 100 aircraft,” Slyusar concluded. Speaking of specific programs the head of UAC revealed that 2017 will see elaboration of design documentation for Ilyushin Il-114 regional turboprop and selection of equipment and system providers for the aircraft, as well as certification application. The company also expects to sign a contract with GTLK State Transport Leasing Corporation, on promoting the aircraft on the market. 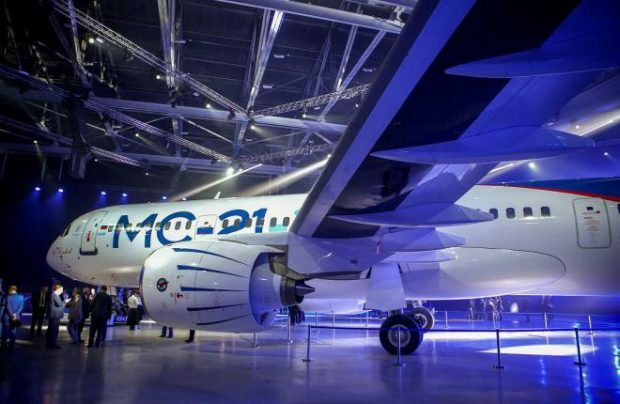 Regarding the new MC-21 narrow-body, which is expected to start flight testing this spring, UAC aims at signing LOIs and contracts with operators before the end of the year and unraveling of serial production. Commenting on the joint Russo-Chinese project of a wide-body aircraft, Slyusar reminded that Chinese operators alone would require approximately 1,100 of such aircraft in the period from 2023 to 2045. From the moment the program is launched and until the first flight seven or eight years will pass, and the first delivery is not expected earlier than in 12 years from the official launch. So until the new aircraft emerges the producer decided to sustain the existing project of Il-96-400M, for maintaining its competences.